For my first Wednesday Book, I’m going to talk about My Own Two Feet by Beverly Cleary, which I bought when it was published and have probably read once a year ever since. It is one of those books where its personal significance for me has changed over the years. 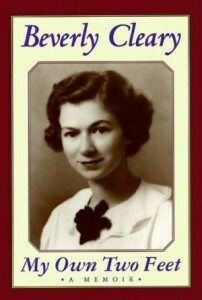 This book is the second half of her autobiography, covering her college years and early adulthood in California and Washington. When I was younger, I think I just liked how vividly Cleary painted life for a young woman in her social and economic position in the 1930s and 1940s. I’ve always liked books with a clearly painted world, from the lands in the Oz books to Harriet the Spy’s Manhattan/Water Mill to Stoneybrook in the Baby-Sitters Club. It makes me feel like I understand what average life was like at the time. But reading it as an adult/aspiring author, I see how it is the autobiography of a writer, and a late-blooming one at that. The book ends with the publication of Henry Huggins in 1950, when Cleary was 34, four years older than I was now. She didn’t have reams of unpublished novels when she sent it off. She didn’t really write at all until she wrote that book. She simply gained life experience until she was ready–even though, like me, she felt always felt like she was going to become a writer, and had been encouraged along the way by her teachers. What I gain from this book is: You sit down ready to write. You take all of your life experience up until that point, and write the book you would have wanted to read, and you write it honestly. That is why I think Beverly Cleary’s books have been resonating with children for 66 years. Reading her autobiographies–A Girl in Yamhill covers her childhood and high school years–also makes it interesting to go back and reread her books, because so many situations and details in her books were lifted from her life. The house and family in The Luckiest Girl, for example, mirror the relatives she lived with during her first year of college and their home. And you get all of the little details of the era that make it seem real. All of my grandparents were born in the same general timeframe as Cleary, and I was never able to hear their stories. In a way, I feel like I’ve absorbed her story as I would a grandparent’s. I’ve even gone on Google Earth to try to find her aunt and uncle’s house to see if it’s still there and what it looks like now. If you have any recommendations for similar author autobiographies, let me know. I’d love to find more that could mean as much to me and be as inspiring to me as this one.